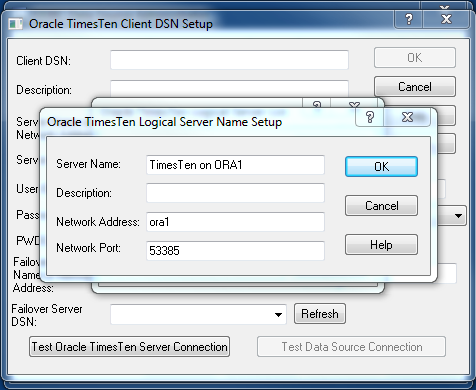 A logical server name is used on the TimesTen client to connect to remote OracleTimes Server processes that do not listen on the default port or for local client/server using shared memory inter-process communications. This document will detail the steps to create a logical server name on Windows. On Windows the logical server names are configured using the ODBC Data Source Administrator. 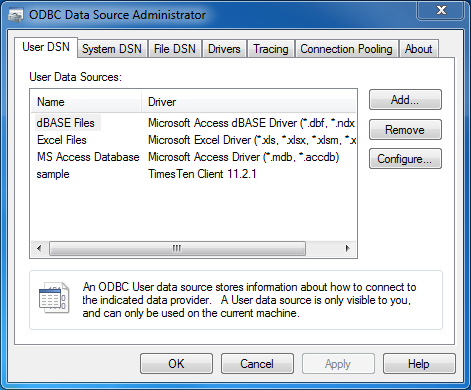 The ODBC Data Source Administrator can be found under Administrative Tools in the Control Panel. Creating a logical server name is done within the context of creating a client DSN so you can configure an existing client DSN or create a new client DSN. This document will assume there is not an existing client DSN. On the User DSN tab click the Add… button to start the DSN creation process. 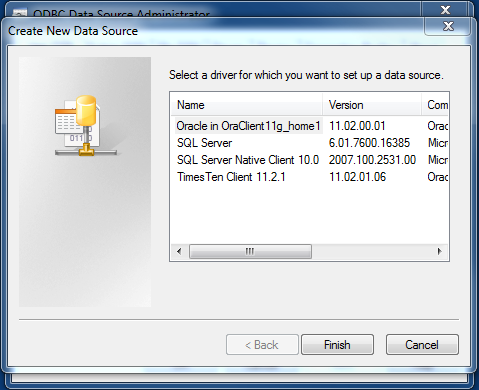 On the Create New Data Source dialog select the Times Ten Client 11.2.1 driver and click the Finish button. The Oracle TimesTen Client DSN Setup dialog will display next. Click the Servers… button to bring up the Oracle TimesTen Logical Server List dialog. Click the Add… button on the Logical Server List. 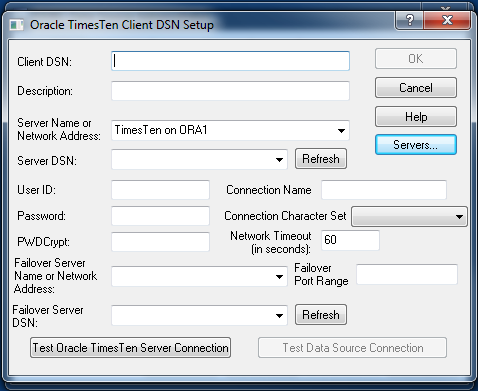 On the Oracle TimesTen Logical Server Name Setup dialog enter a name for the Server Name, an optional description, the host name or IP address of remote server hosting the TimesTen database and the network port. You can verify the network port on the remote server by running the ttStatus utility on the remote server. If the logical server name is for local client/server connections you can use ttShmHost in the Network Address field to signify the use of shared memory for inter-process communications. Once you have completed entering your values click the OK button to save the changes. 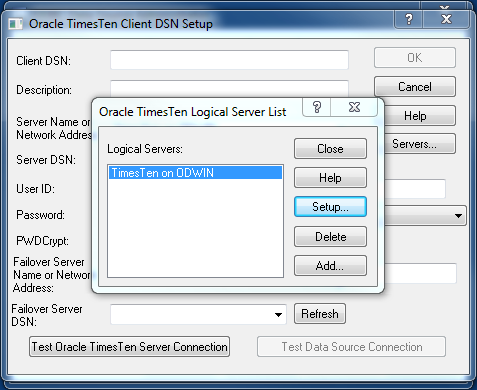 Click the Close button on the Oracle TimesTen Logical Server List dialog to return to the Oracle TimesTen Client DSN Setup dialog. You should see that the Server Name or Network Address field contains the logical server name that was just created. 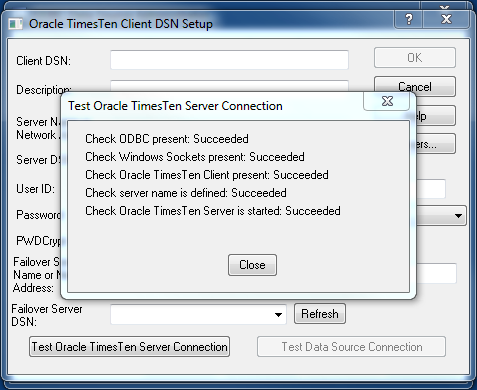 You can test the logical server name by clicking the Test Oracle TimesTen Server Connection button. All of the checks should show succeeded. Click the Close button to exit the dialog. 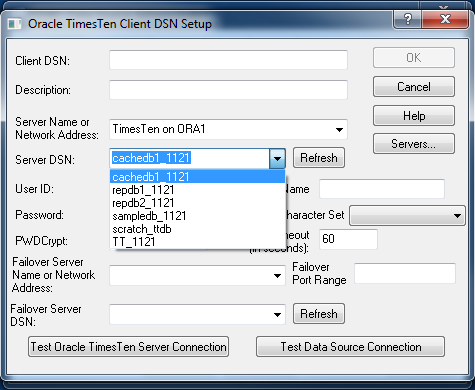 You can see a list of all the configured Server DSN for this logical name by clicking the Refresh button. If there are any configured Server DSNs on the remote server they will be listed in the drop down. Set of the logical server name is complete. You can click the Cancel button to exit the creation of the client DSN.